SEOUL, Sept. 13 (Yonhap) — South Korea is hoping to host preliminary games of an Olympic baseball qualifying tournament next year, the operator of the top domestic pro league said Thursday. 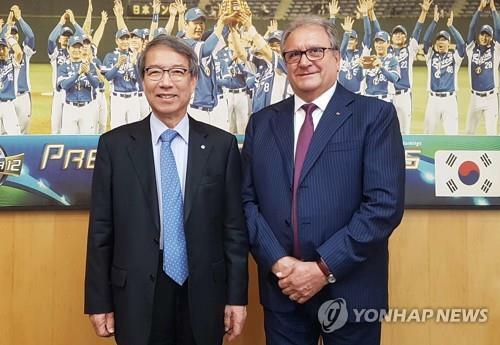 The Korea Baseball Organization (KBO) said its commissioner, Chung Un-chan, met with the president of the World Baseball Softball Confederation (WBSC), Riccardo Fraccari, at the KBO headquarters in Seoul on Thursday. The two discussed having early round games of the 2019 Premier 12 tournament in Seoul in November 2019. The KBO said the two sides need to hammer out more details before making the final decision. Japan will host the second round and the finals. The 2019 Premier 12, open to the top 12 countries in the WBSC world rankings at the end of 2018, will be the first qualifying event for the 2020 Tokyo Olympics. Baseball will return to the Olympics in the Japanese capital after an eight-year absence. 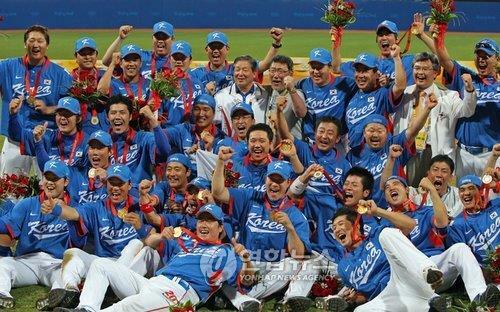 South Korea won the most recent Olympic baseball gold in Beijing in 2008, and also won the inaugural Premier 12 in 2015. Baseball at the Tokyo Olympics will feature six nations. The WBSC said the top finisher from the Americas and the top country from the Asia/Oceania region, excluding Olympic host Japan, will earn direct entries into Tokyo 2020. The WBSC will also organize separate qualifiers for Africa/Europe and the Americas. Its intercontinental qualifier, featuring six teams, will be the final opportunity for countries to book their spots at Tokyo 2020. The participants in that one will be the runner-up from the Africa/Europe qualifier, the second and third-place finishers from the Americas qualifier, the two best finishers from the 2019 Asian Championship who haven’t already qualified for the Olympics and the winner of the Oceania qualifier. The WBSC said each Olympic baseball team will feature 24 players, and they must be at least 18 years old to compete in any of the qualification events and in the Olympic tournament.